It’s been a month and a half since we bought a pair of them. I now consider them to be among the items on the farm with the best ROI (return on investment) of anything a small farmer can own. 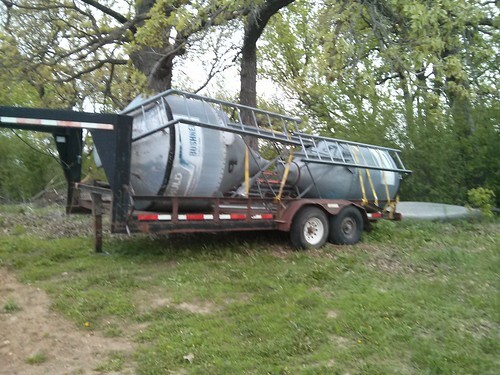 We picked up this pair of 3 ton bulk feed bins on Craigslist for $250 each. We’ve had a gravity box for a few months, and wile it will hold 3 tons of feed, it isn’t real weatherproof. Even parked under the polebarn with a tarp on it will keep all the water out. Then you get $50 of ruined feed in the bottom of the gravity box. Not good. 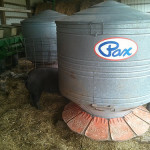 The first feed bin was in great shape, and We’ve been using it to store the pig feed in for the past 5 weeks. All the feed stays dry, and filling a bucket is a snap. 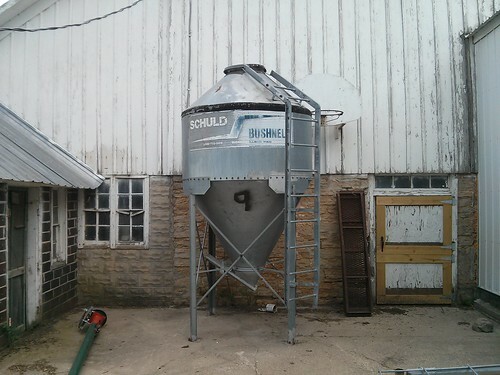 Just put the bucket under the hopper, and open the slide, the feed will dumps out into the bucket. 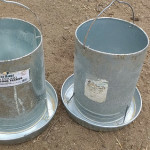 Unlike a gravity box, a feed bin isn’t mobile, so unless you have the equipment you have to pay the feed company $50 to deliver in their truck. Even with the delivery fee, bulk feed is wayyy cheaper than the bagged stuff. 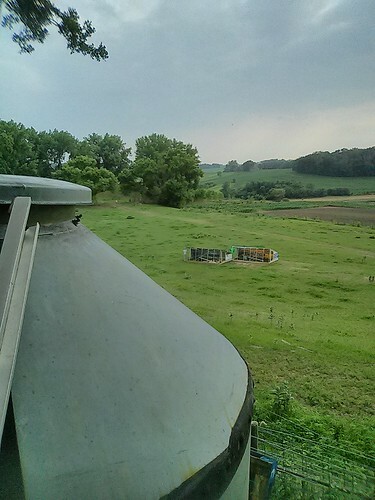 These feed bins can pay for themselves with the first ton of feed that you order. Now that we have 150 broiler chickens and 50 turkeys, the second feed bin is about to be pressed into service holding chicken & turkey feed. We have to pay a lot of money for our unmedicated chicken feed, about $700 per ton, versus about $450 per ton for bulk chicken feed. Ironically, adding antibiotics makes the price of bagged feed go down, because so many other people use antibiotic-laced feed. Our local co-ops make and bag their own medicated feeds, but they sell so little antibiotic-free feed that they don’t bother. Instead they order it in from a bigger feed supplier (Purina in this case) which means that it costs more. If you buy bulk feed, they can easily omit the antibiotics, which means that you actually save the $2-3 for the load if you, like us, choose not to feed antibiotics. 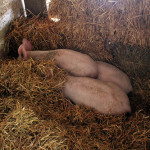 Antibiotics in animal feed are cheap. I don’t know if it reflects worse on our healthcare system or our industrial agriculture system. 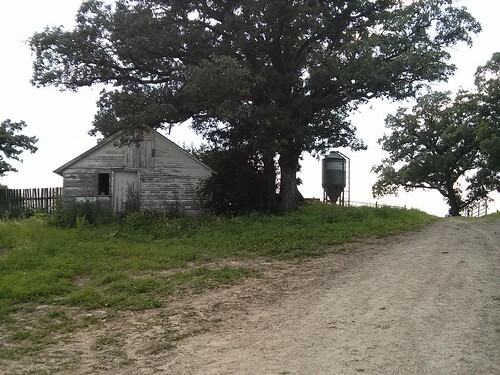 Anyway, we set up the second bin on top of the hill behind the chicken coop. Just a short distance from the chickens and turkeys out on pasture on the other side of the hill. The only problem was that the hopper on the bottom of the bin was rusted through in a few places, which would seriously hinder it’s ability to store grain. 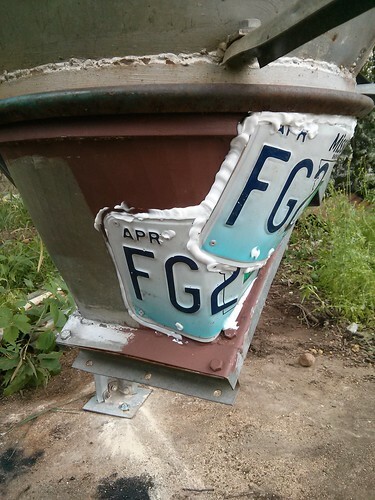 Rust was scraped off, Rustoleum rusted metal primer was painted on, old license plates were affixed over the damaged areas and fastened with pop-rivets and a generous bead of caulk went over the whole works. Now I just have to make some calls to the local co-ops to do a little feed price comparison. Saving money on feed is a big deal for any livestock farmer, as feed costs are a huge part of the expense associated with raising an animal. Controlling feed costs can be the difference between making a profit or a loss. Yes, it’s interesting to see what percent of our costs are feed. I think it’s upwards of 80% on my farm with the high prices now. 80% sounds about right for expenses, but we also figure in labor, which usually comes out as a bigger expense than feed. Since we don’t (yet) cut ourselves a paycheck, the feed is the biggest expense. $250 each is a great price!